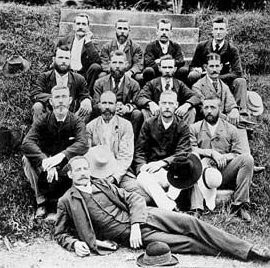 The 6th of May marks the anniversary of the culmination of the Shearers' Strike in 1891 at Barcaldine, Queensland, when the colonial administration ordered the arrest of the shearers' leaders on charges of sedition and conspiracy. Few Australians are aware of the facts and circumstances of this great "revolt" by these ordinary working men. The strike, during the overseas induced depression of the 1890s, was in response to the pastoralists reaction to falling wool prices of intending to reduce the shearers wages, then at one pound per hundred sheep shorn. At the time the pastoral companies comprised mainly of huge sheep runs owned either by British investors or local owners heavily indebted to London bankers or British speculative capital, resulting in overseas control, with first priority being to obtain return on investments - and for profits to be remitted back to England. The standard of living of Australians was a secondary consideration to the foreign-connected "patriotic" business class. The Strike originated from the 5th January 1891 at the Logan Downs Station near Clermont, when manager Charles Fairbain required shearers to sign the Pastoralists Association contract of free labour, prior to commencing work, as the first step in reducing union influence in the sheds, but the assembled shearers to a man declined to work other than under their union's verbal agreement. The union's terms included continuance of the existing rates of pay, protection of their rights and privileges under just and equitable agreements, and a "closed shop" to exclude scabs or Chinese labour. In the 1880s unionism was like a religion to the exploited bush workers, and was seen as a source of salvation from the years of tyranny as had been dealt out by employers. Unionism was the natural expression of mateship which the bush workers readily understood. In 1890-1891, Brisbane was also a centre for radical republicanism from where The Worker newspaper (issued by the famous William Lane) wrote "you can take all social injustices and industrial inequalities and vested interests and strangle them one by one with your million muscled hands". It was part of the great flowering of Australian cultural nationalism of the time. One historian wrote "The extinct bushman of Lawson and Furphy became the actual culture hero whose supposed characteristics many Australians tended, consciously or unconsciously, to model their attitude to life". Indeed it was upon the bush that Australian literature drew its native flavour and created its style in the gutsy pages of The Bulletin magazine. The Bulletin set the tone and tapped the political feelings and the writings of the bush Australian, the pioneer, the working man. The striking shearers formed themselves into bush camps whilst refusing to supply their labour and, being used to roughing it, developed an orderly existence waiting out negotiations by the union organisers. In February 1891 the centre of the strike shifted to Barcaldine, the terminus of the rail line from Rockhampton and at the centre of the Mitchell district, the richest pastoral area of the colony, and where some 30 stations, including the 90 stand Beaconsfield Station were affected. The shearers' camps at Lagoon Creek and Blue Bush Swamp swelled to 400-500 men. By March the battle lines had been drawn as the pastoralists brought in their "free labourers", who were booed and jeered by the strikers; some of the imported labourers joining the union ranks. The influential George Fairbain of the Pastoralists Association demanded special action against union officials soliciting the free labourers. The Colonial Authorities ordered police and troopers to protect these scabs from the unionists, having to ride from woolshed to woolshed to drive off the union shearers, and with many arrests occurring. Woolsheds and crops went up in flames. The shearers raised the Southern Cross flag of the Diggers of Eureka and took the Diggers' oath saying they would fight to the end, arming themselves and engaging in military drilling. The demand for a Republic arose! Parades were held at Clermont and Barcaldine by both the unionists and the military, and at Peak Downs in a demonstration of strength, shots came close to being fired. Arrests were made but the strike went on, before the Colonial Secretary - in time honoured fashion - ordered the arrest of the union leaders. 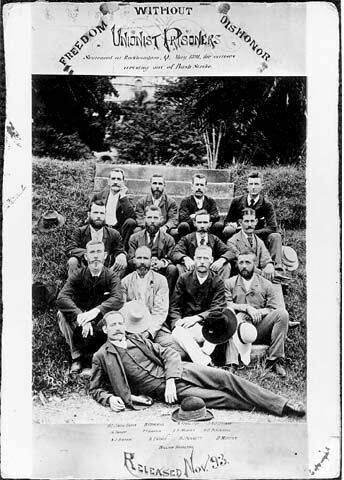 Mounted troopers went to the camp at Capella and arrested the unionists involved in the jostling of George Fairbain at the Clermont railway station. At Barcaldine the police station was guarded by infantrymen with fixed bayonets as one hundred and twenty mounted infantry surrounded the union office, arresting the strike committee. They were charged under obscure British legislation with conspiracy and sedition. It was a mortal blow to the union and the shearers and by June the strike had collapsed as the men dispersed. Thirteen of the union leaders were brought to trial at Rockhampton, and were sentenced to three years goal at the St Helena island prison; as well as receiving, on release, the punishment of two hundred pound, twelve month good behaviour bonds. The failure of the strike broke worker militancy and hastened the call for a political movement to represent the interests of working people, leading to the creation of a labour party which carried many articles of the republican faith, but never went far enough. The present Labor Party hierarchy and many of the current union leadership would be treated with contempt by the workers of 1891, as traitors to their vision of the future of Australia. This folkloric and nativist political heritage rightly deserves to be celebrated by modern day Australians as part of our unique culture. A political order of visionless weaklings, subservient to multinational corporations and international high finance, increasing overseas ownership of our great wealth, massive foreign debt, and debilitating unemployment. As well as all this, Australian workers must again compete with cheap coolie-type labour, with calls for reductions in workers' conditions, all to the detriment of ordinary citizens and our standard of living. In addition the politicians of the Labor, Liberal, National, and Democrat parties, hand-in-hand with CEDA (theCommittee for the Economic Development of Australia) - the politicians' big business "partners-in-crime", now promote the destructive doctrine of multiculturalism, the most insidious anti-Australian programme yet devised. Multiculturalism means No Culture, for it has no unifying purpose, no goals, no common heritage. It has undermined social cohesion; it has destroyed union solidarity. This obscenity is part of the creation of a divided, resource- devouring polyglot society, necessary to enmesh Australia's future with an Asiatic trade block: all for supposed monetary profit. It relegates our Australian culture to being worthless and is an insult to Native Australians. It spells the end for the Australia built by our pioneers, the Anzacs, and others including the striking shearers of 1891. The call of an Asian future is nothing but a graveyard! Nationalists call upon citizens to demand the dismantling of multiculturalism in favour of our Australian culture in every facet of Australian life. We also demand the abolition of the public holiday being held in honour of the English Queen's birthday on 11th June each year. This charade, an event totally irrelevant to nativist Australians, must be abolished, and replaced by "Australian Workers' Day" - to be celebrated on the 6th May. Nationalists seek the creation of an Australian National State where, without compromise, Australian cultural, economic, and political independence will prevail, and where the wellbeing of the Australian worker is paramount. Our first loud notes of defiance! Our cry of "Australia only"!